We began researching ecommerce websites back in the year 2000, during the dot-com bubble. Since then, we have continued to research ecommerce usability and the customer experience. For the fourth edition of our Ecommerce User Experience report series, a team of 7 NN/g researchers conducted a large-scale, lab-based usability study including 63 defined test activities across 49 unique business-to-consumer (B2C) ecommerce websites. A total of 16 users participated, and each was given a subset of the 63 test tasks. In addition to this large, lab-based study, researchers also conducted many smaller, more targeted research studies in order to update and evolve each of the 11 topical ecommerce reports included in the Ecommerce User Experience report series. It’s interesting to reflect on ecommerce websites and online shopping behaviors of the past to see how far we have come over the years. When we look back at the trends, challenges, user behaviors, and user expectations from prior research and compare these to those of today, the changes are dramatic. Designers have learned a lot over the years and they have substantially improved ecommerce user experience. Congratulations! However, as with anything, we now notice new challenges related to the current ecommerce landscape and the ever-evolving customer expectations for online shopping. In this article, we outline some of the largest differences and themes in the expectations of today’s ecommerce shopper. As online retail continues to progress, competition with powerhouse platforms like Amazon, Alibaba, and Walmart is becoming a major factor in how all other retailers conduct business and advance in ecommerce. These large sites offer consumers one-stop shopping, unmatched selections, low prices, convenient and speedy delivery, and other perks like free shipping and free return shipping. As Jakob’s Law of the Internet User Experience states: users spend the majority of their time on other sites than yours. So, there’s no doubt that consumers’ experiences with these big players raise expectations and put pressure on other retailers to provide the same quality of service. The battle for ecommerce market value is now centered around who can meet customers’ growing expectations for shopping experiences that are simple, fast, reliable, and convenient. As ecommerce retailers begin to offer flexible shopping experiences across a variety of channels, users’ expectations for convenience in online shopping are increasing. They want to shop on their terms, whenever and wherever they are, regardless of the device or channel. Companies often consider the digital and physical experiences as two very different and discreet experiences. However, customers do not. They expect the physical and online worlds to blend seamlessly. Shoppers want the ability to go to a physical store to view, pick up, or return products discovered online. In-store pickup is convenient for users when an item is needed quickly or when they want to avoid shipping charges. In addition, seeing accurate and reliable inventory information for nearby stores on an ecommerce site provides the convenience and peace of mind of knowing where to get what you need, right away. Participants in our studies appreciated ecommerce sites that prevented them from wasting time on pointless trips to the store. They praised sites that took this one step further and even facilitated the movement from the web to the store by offering specific details about where items were located in stores or by letting users request that the item be ready when they arrive. Another facet of convenience is helping customers reorder regularly purchased items with little effort or offering capabilities to schedule recurring orders, so they never have to worry about running out of a product they often use. Large players like Amazon and Walmart have identified this opportunity and built it into their offerings. Voice-activated shopping with Alexa, Siri, Google Assistant, and Cortana is a new channel for interaction, but the idea that users can simply tell a device what items to order from their favorite sites takes convenience to a whole new level. Going forward, these technologies have the potential to add to the heightened expectations for convenience. In the past, ordering online often meant waiting for days or even weeks for the product to be delivered. Not anymore. Amazon has offered quick 2-day shipping for several years, and more recently it started offering same-day delivery, that, in many locations, can be customized by shoppers down to the hour. This is a step outside of the stereotypical “box” of delivery options dependent on third-party shipping providers (like UPS, FedEx, and government postal services). As a result, today’s online customers have a desire for instant gratification and immediacy when it comes to interacting with ecommerce retailers. Speedy shipping is a major benefit for web shoppers who are overwhelmed with options these days, and fast-delivery options differentiate retailers from their competitors. Users’ need for speed is not only about fast shipping — one-click ordering and streamlined purchase workflows are explored by retailers to get users through their shopping activities fast and with little effort. A quick and seamless experience resonates well with customers who are looking to maximize their productivity online. Delivering on these expectations can build trust and loyalty. 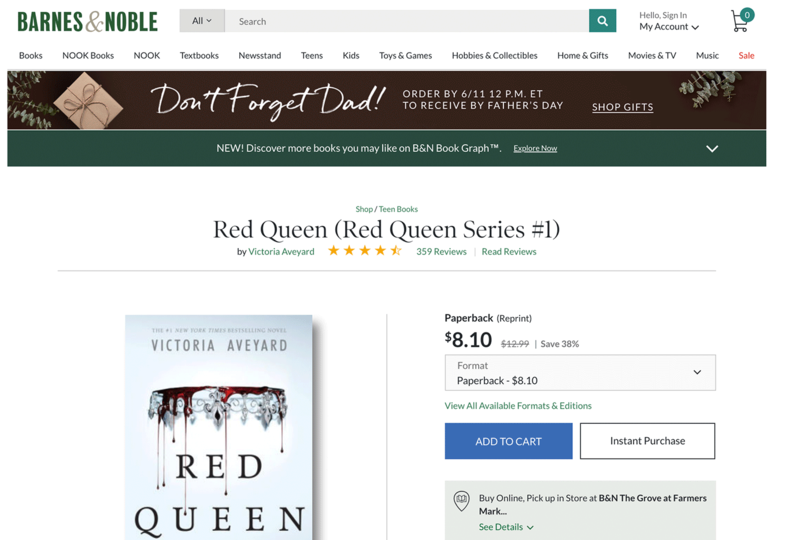 Barnes and Noble offered logged-in shoppers the option to make an instant purchase on product-detail pages, bypassing the checkout workflow and making online ordering literally as simple as the click of a button. 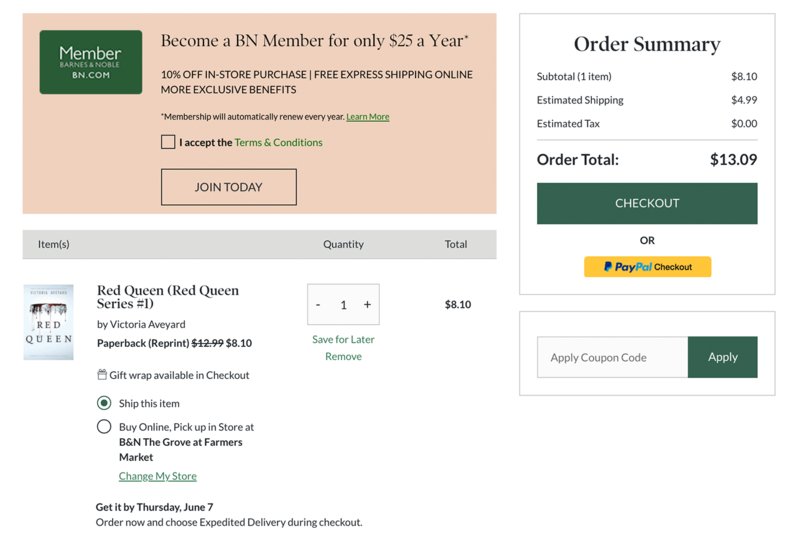 For users who opted to take the traditional path through checkout, Barnes and Noble conveniently offered the option to pick up the item at the closest store. It also allowed them to use PayPal to save on data entry and speed up the checkout process. Users’ expectations for privacy and security assurance on ecommerce sites have increased, while their patience with issues in such matters has decreased. Heightened standards for security stem from data breaches and broken trust with companies such as Facebook, Equifax, and Yahoo, who have faced major security incidents recently. If users are unsure about the security of their data on an ecommerce site, they will be less likely to return. Shoppers in our studies wanted to feel safe and needed to know that sites had the proper security measures and protections in place. Invest in these areas and speak to users to address their concerns about data safety. Communicate how seriously you take your customers’ data throughout the experience, to assure users that they are protected. Standards for accuracy have also increased. Users have had positive experiences with organizations that provide incredibly precise information. Today’s shoppers expect precision in geolocation information, inventory data, order-status messages, pickup time frames, pricing, arrival dates, and user reviews. When our study participants encountered sites with only vague product information or broad generalizations about delivery timeframes or additional surcharges, they became frustrated. They didn’t understand why the company did not provide the same specificity that they had received from other companies. Pottery Barn’s oversized products were subject to a flat-rate delivery surcharge, but the product page did not indicate the actual cost. Users who diligently read the page could find what the surcharge was by clicking the link to the Shipping and Delivery Information Page under the Shipping and Returns accordion. On that page, they could finally find a fee calculator that allowed users to input their postal code to determine the flat-rate fee. 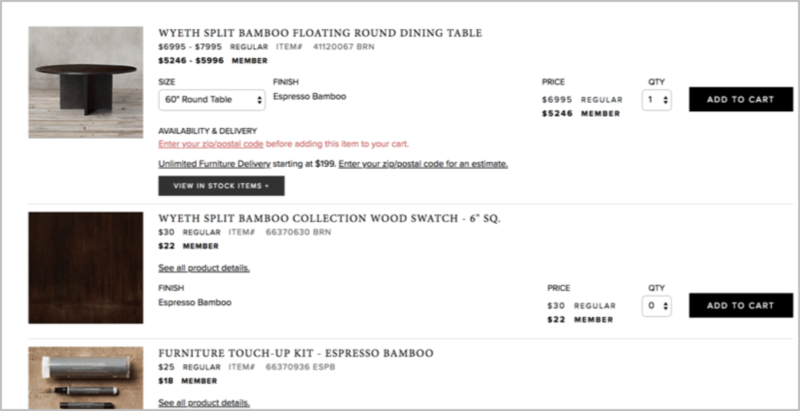 Pottery Barn’s oversized Product Pages indicated that a delivery fee would apply, but did not specify what the fee was. It was very difficult to get an actual value without going all the way through checkout. Additional surcharge information on the Product Detail Page was not helpful. A link here to the Shipping and Delivery Information Page did prove fruitful. Pottery Barn could have been more upfront early on in the process. People want to know how much they will pay for shipping before going through checkout. Rather than the unhelpful detail about flat-rate delivery near the product price, Pottery Barn could have included a minimum delivery estimate. Or even better, it could provide a link to the surcharge calculator at the top of the page near the price — like Restoration Hardware did in the example below. Better yet, embed the location calculator within the product page itself and show the fee for users who enter their ZIP code. 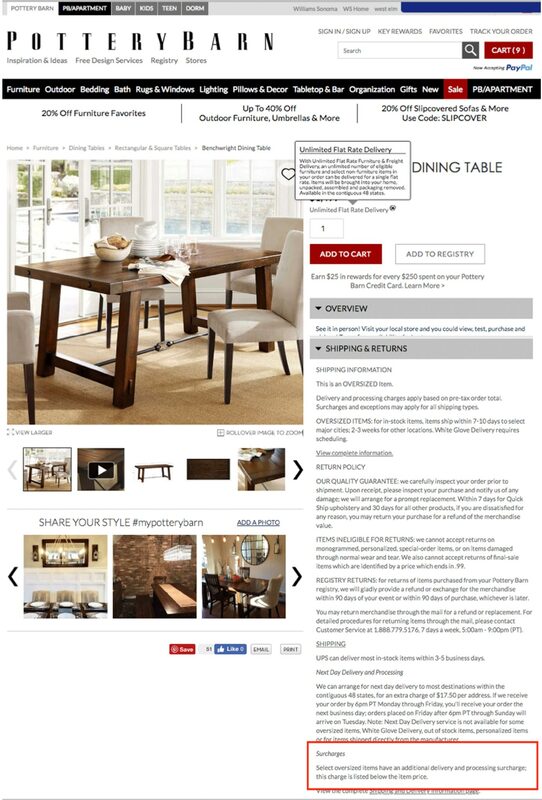 Restoration Hardware indicated that the lowest starting price for furniture delivery was $199, but allowed customers to enter a postal code to get an exact value. In addition to demanding extreme precision, users are also less forgiving about inaccurate information. When study participants were presented with misinformation or when they encountered unpleasant surprises, they immediately grew skeptical and began to question the authority and credibility of the site. One of our study participants was a pit bull owner who was shopping with a gift card on TheTCshop.com, a website that specializes in dog-related gift items and dog accessories. He became annoyed when he noticed that the site had erroneously labeled a different type of dog breed as a pit bull. 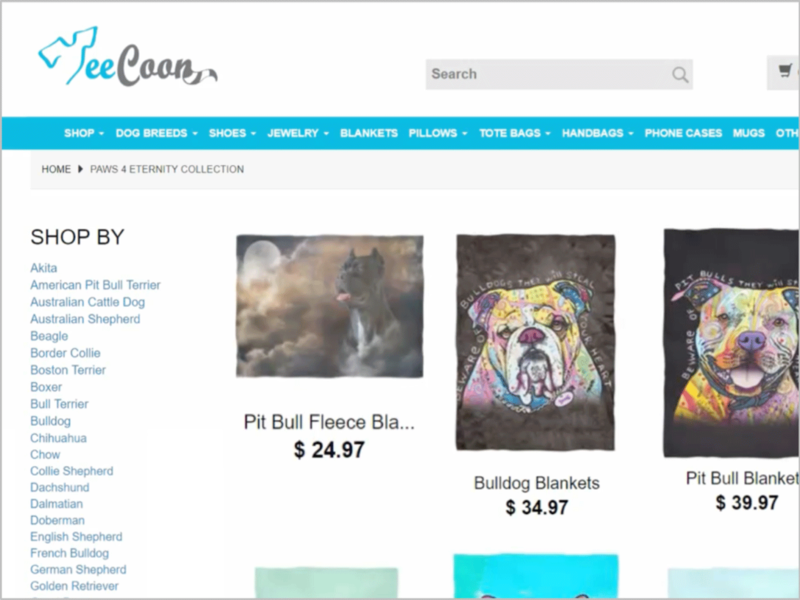 On theTCshop.com, a user noticed an error with how a pit bull product was labeled. He immediately considered the company less credible for making this mistake. Always present users with accurate information. If it’s not accurate or authentic, don’t show it. Strive for precision in dynamic information like delivery timeframes and added fees. The more precise the information you provide, the more in control your users will feel, and that is certainly a feeling you want to foster. In an age where consumers are inundated with options, they question everything — from product information to ratings and reviews. Consider it an opportunity to compete with others and differentiate your business by providing accurate, high-quality information that users know they can trust. In addition to increased expectations for quality information, shoppers also look for better overall customer experience outside of the interface itself. Sites offer choices for payment, shipping and delivery, setting up recurring orders, and even for customer-support channels. Many sites these days take the idea of flexibility to the extreme by offering policies that were unheard of years earlier. This level of flexibility allows customers to interact on their terms and design a shopping experience that suits their needs. For these reasons, users now expect ecommerce sites to give them options for almost anything they can do. 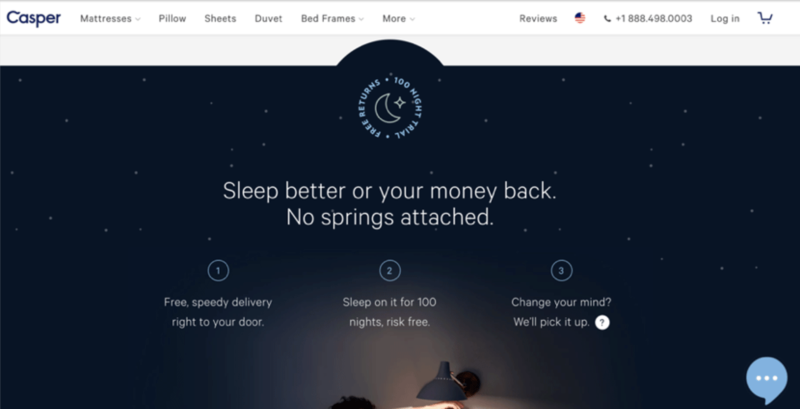 For example, to set itself apart from regular mattress retailers, Casper.com gave users the unique option of trying one of its mattresses for 100 days for free. If the customer is not completely satisfied with the experience, Casper will pick up the mattress and provide a full refund. Casper.com gave users the option to try out a mattress in their own home for 100 days for free. 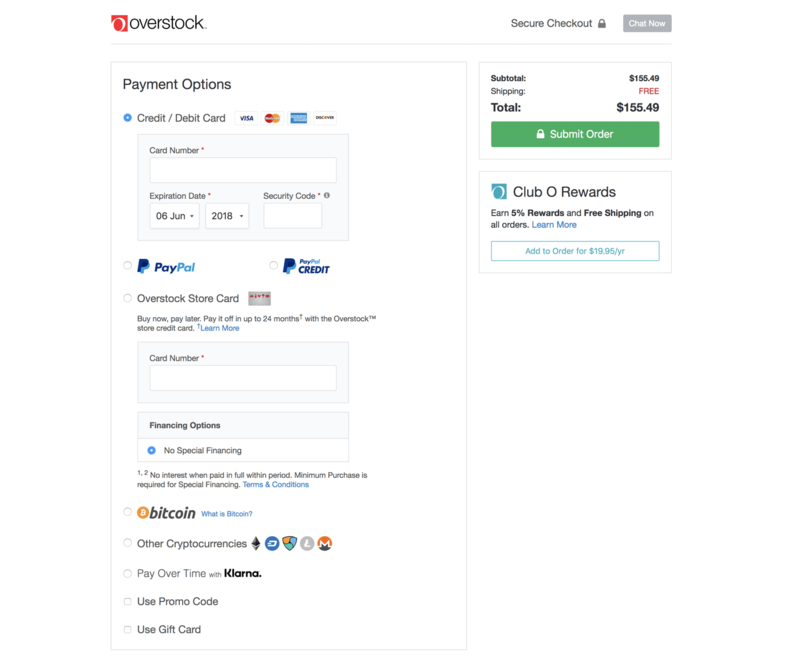 Overstock.com offers many different payment options, including Paypal and cryptocurrencies. Another place where users expected options was customer service. From chat to click-to-call and social media, study participants wanted multiple ways to get help. When customers need to reach out, they should be able to select the channel that meets their unique situation. At work and unable to pick up the phone? You might choose to send a question to a retailer over Facebook. On the road and unable to text? A phone call makes the most sense. Users have different needs and levels of urgency for their issues, so the option to send a quick message rather than sit on hold can be incredibly helpful. 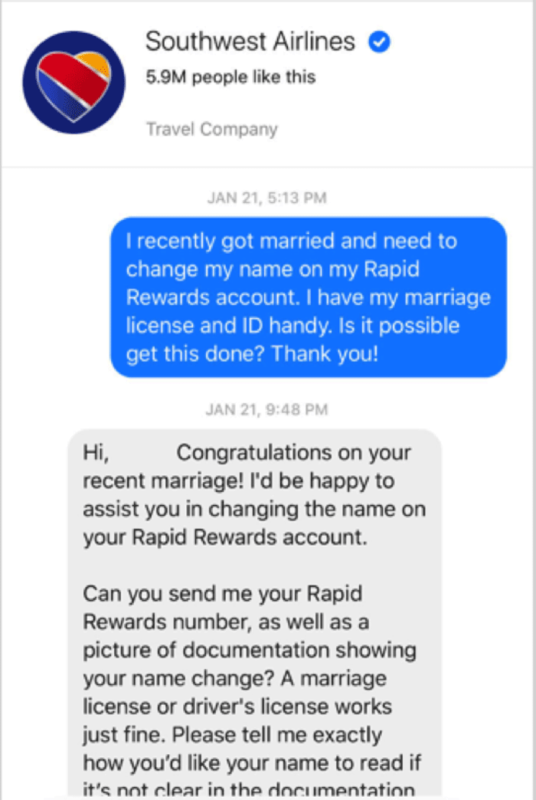 Southwest Airlines offered customer service via Facebook Messenger to help a user change her name on her loyalty account. This method was fast and convenient for her because she was already on Facebook. Southwest Airlines offered many different customer-service options, including Facebook Messenger. 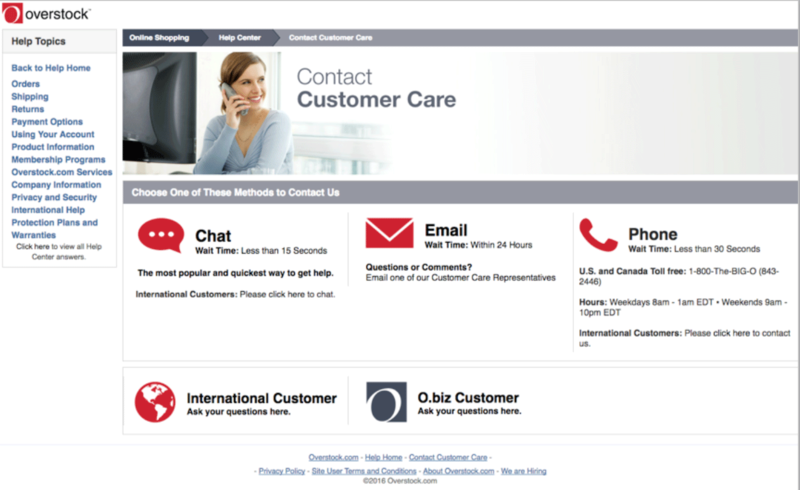 Overstock.com clearly showed all the options to receive customer support along with helpful information about the wait time and responsiveness on each channel. Yesterday’s amazing experience is today’s okay experience. As users’ comfort level with ecommerce grows, they expect added elements of surprise and delight. Details such as impressive and unique packaging, inspirational content, and even digital experiences that are extensions of physical ones, are all ways in which ecommerce retailers can set themselves apart. 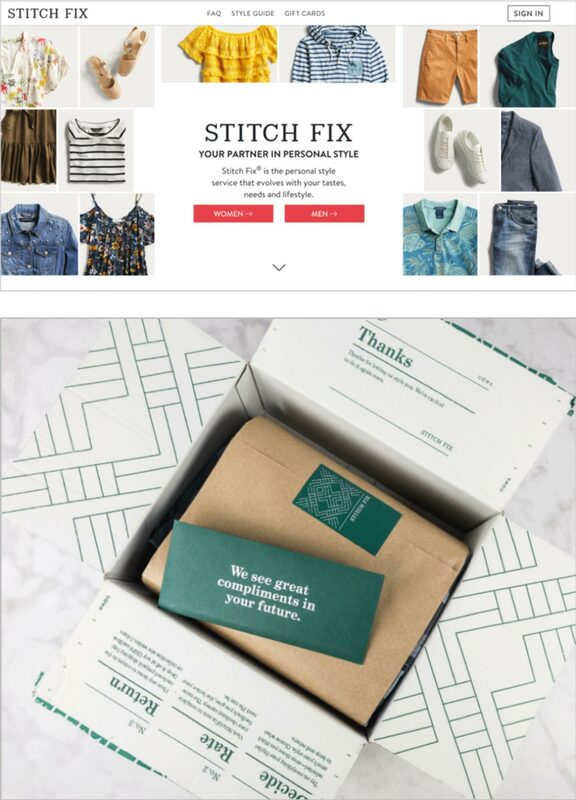 For example, Stitch Fix used experiential details to engage users. The curated-clothing service did a great job of connecting online shopping with an enjoyable offline experience through nice packaging and product presentation, and also by including inspirational outfit ideas in every box. Stitch Fix combined an enjoyable online shopping experience with offline tactics such as nice packaging and outfit ideas to surprise and delight its users. Neiman Marcus introduced the Memory Mirror in some of its stores. The mirror took video and stills of what users tried on to aid them in comparison shopping. It allowed the user to virtually change the color of the item they were wearing and provided 360-degree views so that, when the customer moved, it adjusted to show all the angles. Snapshots from the digital mirror could be shared with others. 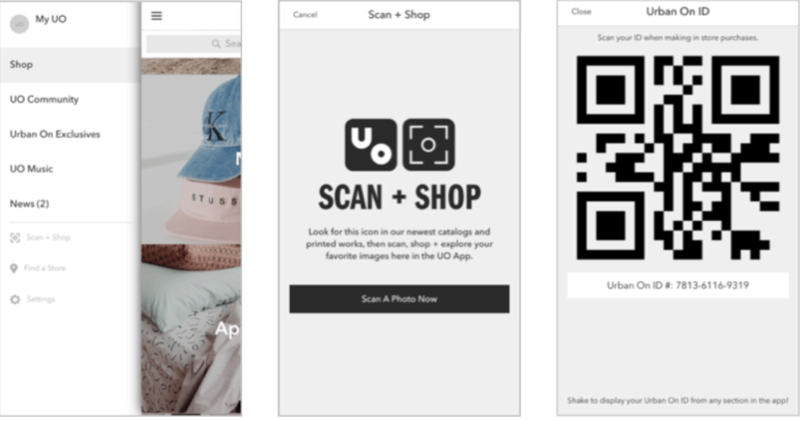 In another example, the Urban Outfitters app included a scannable ID that made it easy for shoppers to earn rewards in the store during the checkout process. Urban Outfitter’s mobile app had special in-store features to enrich the shopping experience. One study participant was excited to learn that Office Depot archived all of the in-store purchases she made using her business account number. She said, “I didn’t have to sit on a call and wait for someone to look up my transaction. What a relief! This is brilliant for businesses that know their products might need expensing.” The site also made it easy to reorder previously purchased products in this way. Office Depot’s site catalogued in-store purchases for users. Understanding and addressing customer expectations is important. Users’ perception of their experience is directly dependent on their expectations, and on whether these expectations are met. Think about the changing landscape of ecommerce and how these changes affect how your customers expect to engage with your website and services. Assess your overall customer experience based on the large themes discussed in this article. Think about whether you’re delivering on expectations, or if you’re on track to evolve your offerings to keep up with today’s users’ needs. The 4th edition of our full series on Ecommerce User Experience including 11 volumes of topical design guidelines is now available for download.